The stars came came out Saturday evening. After dinner we opened the kiln to some coaster sets featuring stars. 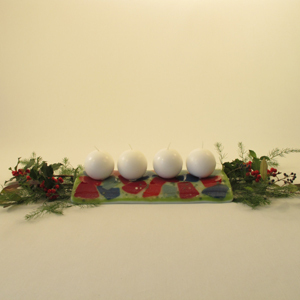 They will be fun for winter holidays or any time someone wants a little star-shine, and they give us design ideas for larger pieces. 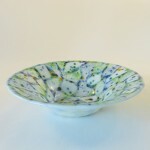 Other new pieces are already waiting to be seen for the first time at one of our late autumn shows. There are several dishes in the Blue & Gold Confetti design, including a pasta bowl and a serving bowl. 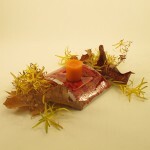 Candle-bridges are destined to dress up holiday tables, especially when garnished with a few leaves, greens, or berries. 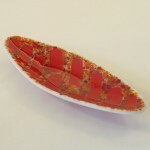 This oval dish seems perfect for autumn, although the inspiration came while I was picking nasturtiums during the summer. 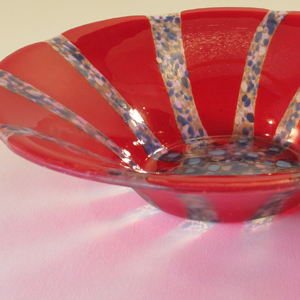 Oval dishes are popular and practical and we’ll have more colors and styles to show off by the end of the month. Curved square dishes are festive for salad, dessert, or any holiday treat. 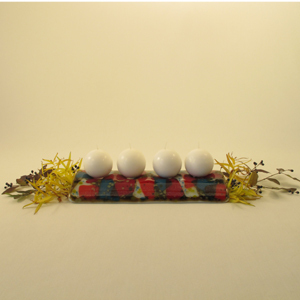 This dish would also prettily set off a pillar candle or a few bright ornaments. 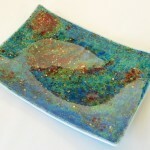 “Starry Sky” is one of the new platters ready to shine this month. Thanksgiving turkey, Hanukkah sufganiyot, Christmas ham, or New Year’s Eve Spekbrot will look even more delectable when served on a work of art. All these pieces and more will star when we exhibit later this month and in December. November 23 and 24 (10 AM–4 PM both days) we’ll be at the Village Arts & Crafts Market, Buckingham Springs PA (near Horsham, New Hope, and Doylestown). 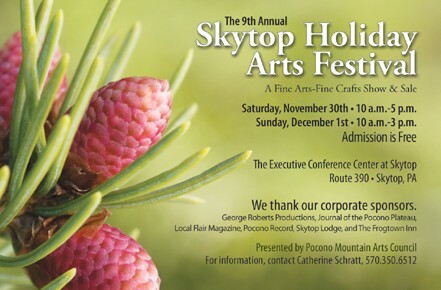 Thanksgiving weekend we’ll be at the Holiday Arts Festival at Skytop Lodge, Skytop, PA. Hours are 10:00 AM–5:00 PM on Saturday Nov 30 and 10:00 AM–3:00 PM on Sunday, Dec 1. 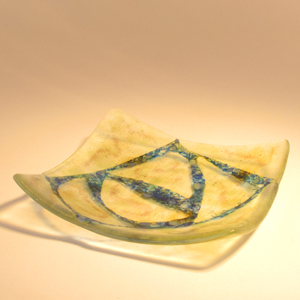 We’ll show both stained glass and fused glass during Holly Days at the EMCA Gallery in Tunkhannock PA from Nov 29 through Dec 22. The gallery will be open 10:00 AM–5:00 PM on Nov 29 (opening day) and Dec 7 (for Christmas in Our Hometown); 1:00–5:00 PM on Nov 30; and at least 1:00–3:00 PM all other days. Call the gallery (507.836.3622) for additional hours. 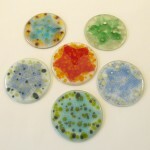 We also have glass at B’s Floral Design, 131 Penn Ave, Scranton PA (10:00 AM–5:00 PM Monday through Friday). B’s will be open until 9 PM during First Friday Artwalk on Friday, Dec 6. The Silver Arrow Gallery in Tannersville PA, on PA 611, shows our work continually. The gallery opens at 11:00 AM each day and closes in early evening. Let’s not just wish upon a star but reach for one this glad season.